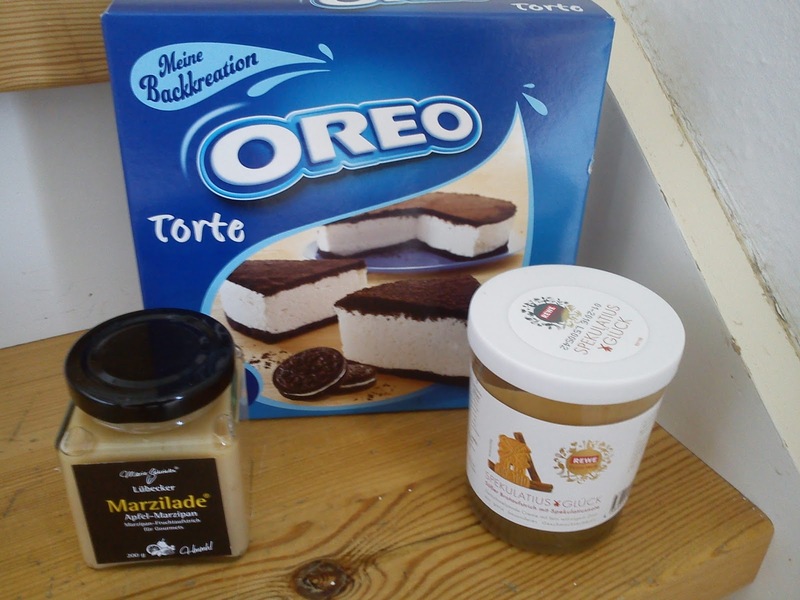 During my last shopping trip to Flensborg, Germany I found these three new food items, which managed to find their way into my shopping backet together with yogurt, sausages, cat food etc. The first has a cake kit for a Orea pie, which caught my eye. I will later tell you, how I found this cake kit. The second thing was a mixture of marzipan and marmalade !!!!! Strange thing, which caught my interest. Last week-end I took part in get-together for rowers participating in the Danish Summer rowing trip on the Thames. 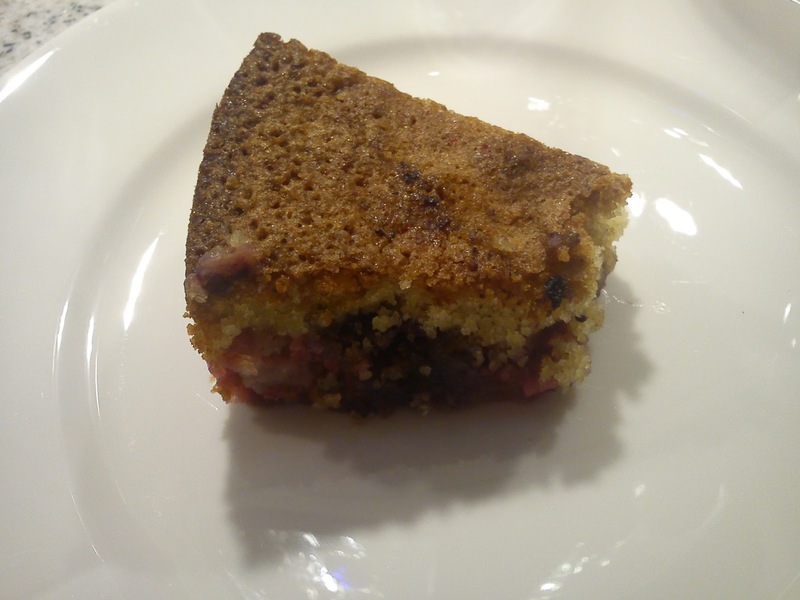 Besides from baking some bread (oat flakes bread with linseed & Rowan's five grain bread) I also baked some cake for the afternoon coffee break, which we had on our whole day rowing tour on the fjord of Vejle. It is not an easy task to transport a cake with glazing in a rowing boat, therefore I had the cream cheese glazing in a separate container, so the glazing was first added on top of the cake just before we ate the cake. So quite many of my fellow rowers thought, that I was spreading humus on of the cake !!!! Squash is very much in season, so I decided to this squash cake with cream cheese glazing seasoned with cinnamon. 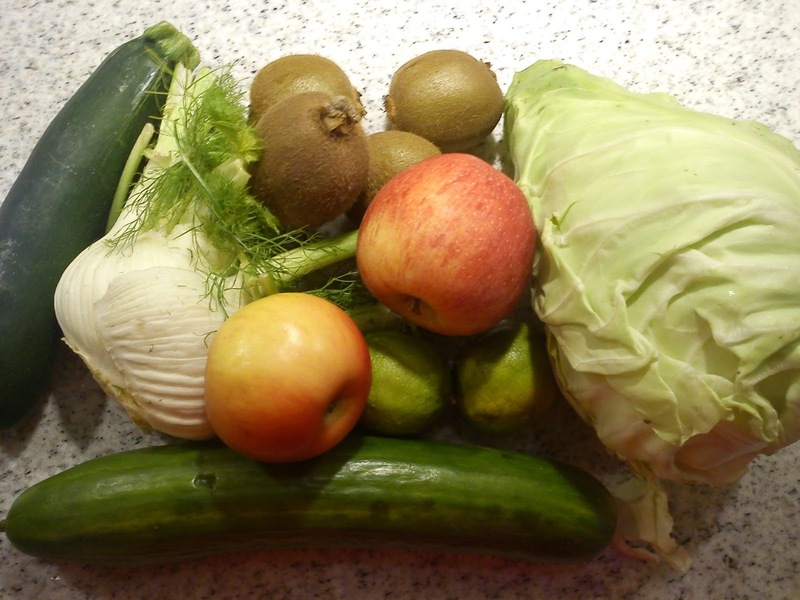 I have got this specific recipe from a colleague at work by the name of Preben. The use of cinnamon in the cream cheese glazing gives an excellent flavour twist combined with a colling sensation. If you do not make the cream cheese glazing, when the squash on it´s own is actually both lactose-free. Heat up the oven to 200'C. Whip the sugar and eggs together into a foamy structure on stand-alone mixer. Add in the oil, baking powder, salt, soda, vanilla sugar and cinnamon, whip again. Add in the flour and whip again. 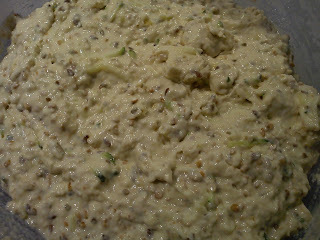 Stir in the grated squash and minced walnuts by hand. Fill the cake dough into a round form (28 cm). Bake the cake at 200'C for 50-60 minutes. Check by fork or meat needle, if the cake is baked. Whip cream cheese, soft butter, icing sugar, vanilla sugar and cinnamon together on stand-alone mixer. Spread the glazing on top of the cold squash cake. Besides from the breads (oat flakes bread with linseed & Rowan's five grain bread), which I baked for last week-end´s get-together for rowers participating in the Danish Summer rowing trip on the Thames, I also make some classic crispbread. 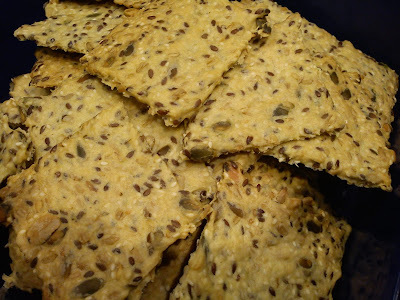 Making this crispbreads I used the easy approach in form of a plastic bag from Svansø full of the grain mix, so I did not have to buy five bags of various grains (oat flakes, sun flower seeds, linseed, pumpkin seeds, sesame seeds), where you do not everything up. It is a very process to make your own crispbread. You just mix the dough together on a stand-alone mixer, put the dough between pieces of baking paper before rolling the dough very fine followed by baking the crispbread. You can actually make these crispbread without getting your hands in contact with the dough. The taste in these crispbread is perfect, so I will for sure make them another time in my little kitchen. Weigh all the ingredients into the mixing bowl of a stand alone mixer. Stir the dough into a homogeneous mass. Divide the portion into two equal portion, which is rolled out between two pieces of baking paper using a rolling pin. Remove the top baking paper, followed by cutting the dough into the individual pieces. Bake the crispbread at 170'C, until they are crisp and brownish in colour. After baking the crispbread break them into individual pieces. Cool them down and store them in air thigh container. 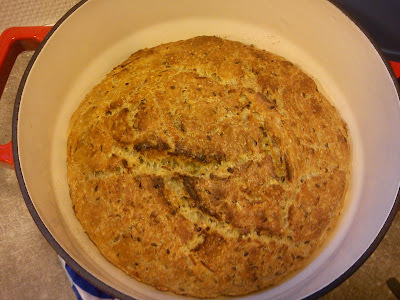 I decided to the bread this easy way as well, this means making knead-free cooking pot bread !!! After looking at various recipes in the bread book "Det æltefri grydebrød", I decided to bake this Rowan five grain bread. 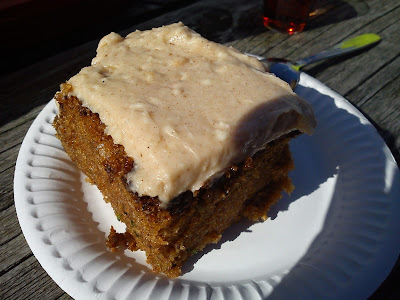 Instead of adding grated carrots I added in grated squash, as I had some leftovers from this squash cake. Stir yeast, sour dough and water together in a big mixing bowl. Add salt, sugar, cracked wheat, five grain mix, oat flakes and grated squash into the liquid and stir well. Afterwards add the wheat flour and stir very well with a cooking spoon. Take the dough out off the mixing bowl, move 1/3 of the dough in over the rest of the dough, keep repeating this process until you have a small size of the dough. Glaze the dough bowl with oil. Place the dough again in a clean dough, let is rise again for 2 hours. Heat up the cast iron cooking pot (5 l) incl. lid on a rack in the lower part of the oven at 250°C (fan oven) for ½ hour. Remove the lid from the cast iron cooking pot, and let the bread bake at 225°C for another 20 minutes. Last week-end I took part in get-together for rowers participating in the Danish Summer rowing trip on the Thames. I was responsible for food part upon arrival of the rowers Friday evening. The food was cheese tapas from the local cheese shop (easy part involving making the food order). So therefore I had plenty of time for making various breads for this cheese tapas. 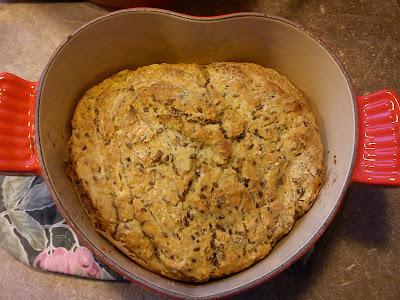 I decided to the bread this easy way as well, this means making knead-free cooking pot bread !!! After looking at various recipes in the bread book "Det æltefri grydebrød", I decided to bake this oat flakes bread with linseed. Stir yeast, sour dough and water together in a big mixing bowl. 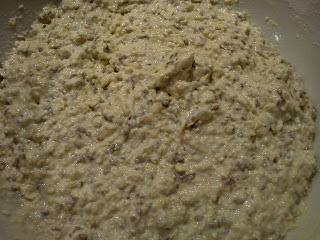 Add salt, sugar, linseed and oat flakes into the liquid and stir well. Heat up the cast iron cooking pot (1½-2 l) incl. lid on a rack in the lower part of the oven at 250°C (fan oven) for ½ hour. Place the dough in the hot cast iron cooking pot, put the lid back on. Place the cooking pot in the lower part of the oven, let it bake at 250°C for 25 minutes. Remove the lid from the cast iron cooking pot, and let the bread bake at 225°C for another 15 minutes. I was positively surprised by this juice. 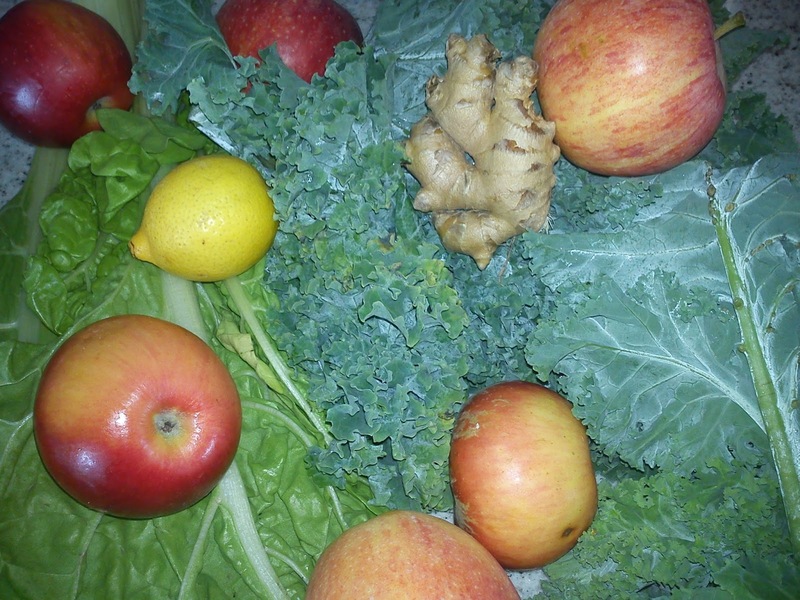 I was expecting a healhty (= ugly) tasting juice due to the use of curly kale and spinach beet, as these ingredients very often bring a loot of bitterness into the final juice. I actually enjoy this juice, as it was quiet sweet without being over bitter, and it could had used an extra 2 cm ginger to be more dominated by ginger in the taste. Enjoy and store the rest of the juice cold in the refrigerator for 1-2 days. My first Summer vacation, which took place in beginning of July, I went rowing on the Thames from Oxford to and through the entire city of London. Passing through London meant, that we had some time for sightseeing as well as shopping in London. 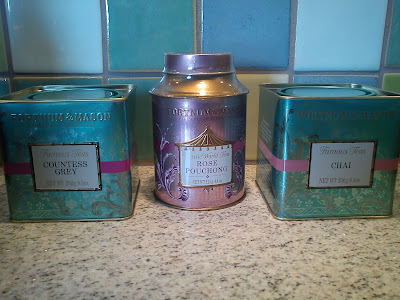 So I had in advance made a mental "shopping list" of buying tea and books, which I also managed to do. Spending time in book shop is another TO-DO thing for me, and London is full of book shops. I think I spend one hour (too little time) doing only a small browsing around a book shop of 5 floors !!! 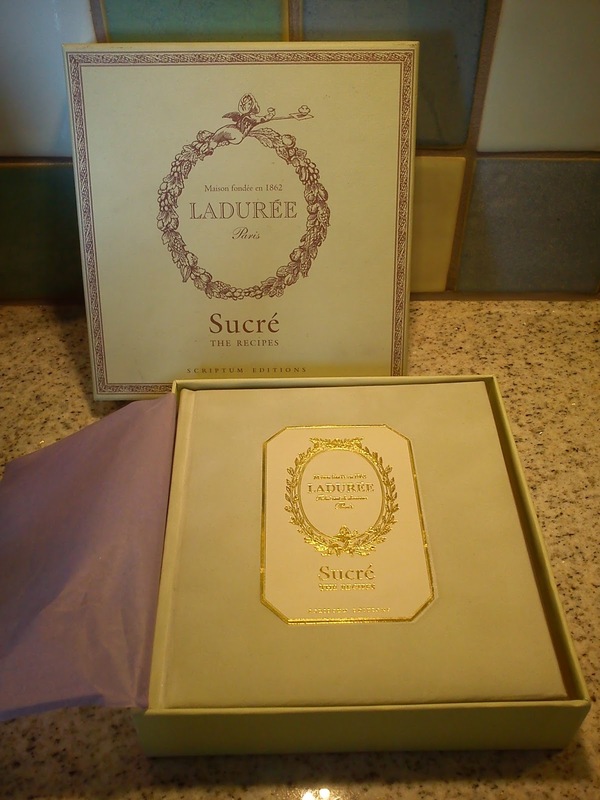 Besides from English crimes I found a cake baking book called "Sucré" from Ladurée, a cake book full of mouth-watering photos. 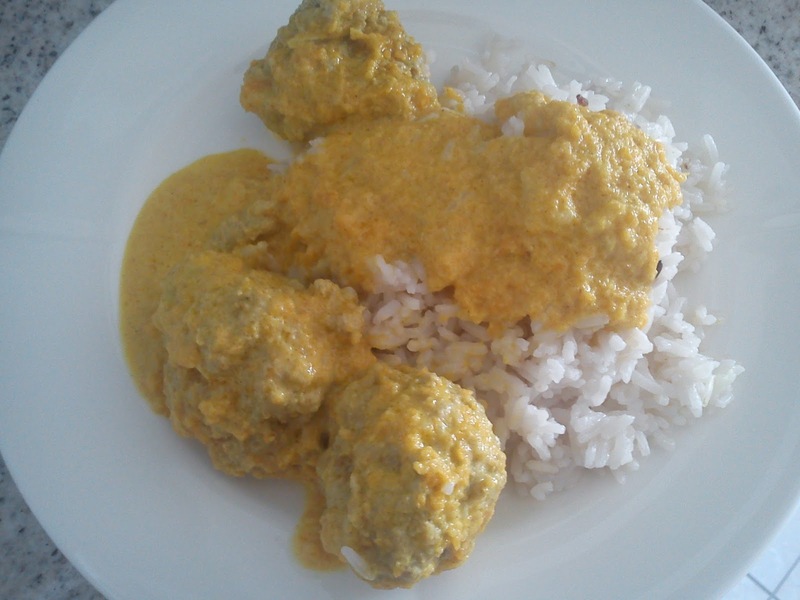 Boller i karry - meat balls in curry sauce is a classic Danish food, which also is referred to mormormad (Grand Ma´s food). Meat balls in curry has always been one of my favourite food, which I always pick, when available for example in the canteen at work. Mix the minced meat together with the onion, egg, breadcrumbs, 1 teaspoon of curry, salt and pepper into a homogeneous mass. Bring a cooking pot full of water (with salt) into the boil. Form the meat mass into smaller meat balls, which when is added into the boiling water. The meat balls are ready, when they pop up to the surface of the boiling water. Remove the meat balls from the water. Keep the boiling water for later use in the curry sauce. Roast 1½ tablespoon of curry in empty cooking pot. Add the olive oil and grated carrots on top of the roasted curry, roast this mix for another 2-3 minutes. Add 3 dl of the boiling water into this curry mix. Let it boil softly for 5 minutes. Blend the curry sauce with a stick blender into a homogeneous mass. Add in the dairy whipping cream. Let the sauce simmer for 10 minutes. Add in the meat balls and let everything simmer for another 5 minutes. Serve the meat balls in curry together with boiled rice. I am actually disappointed about this juice ! 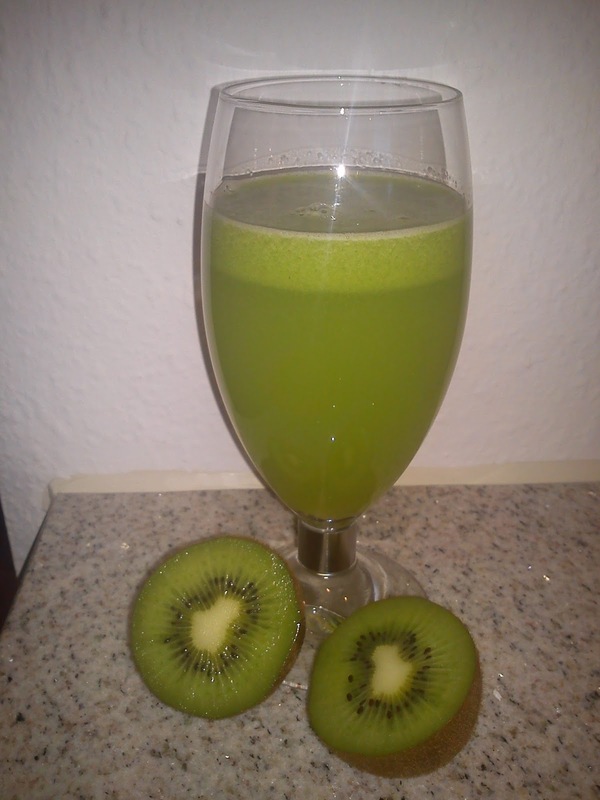 It does not taste to healthy (= ugly), it does not taste great, it actually tastes very bland and uninteresting !!!! 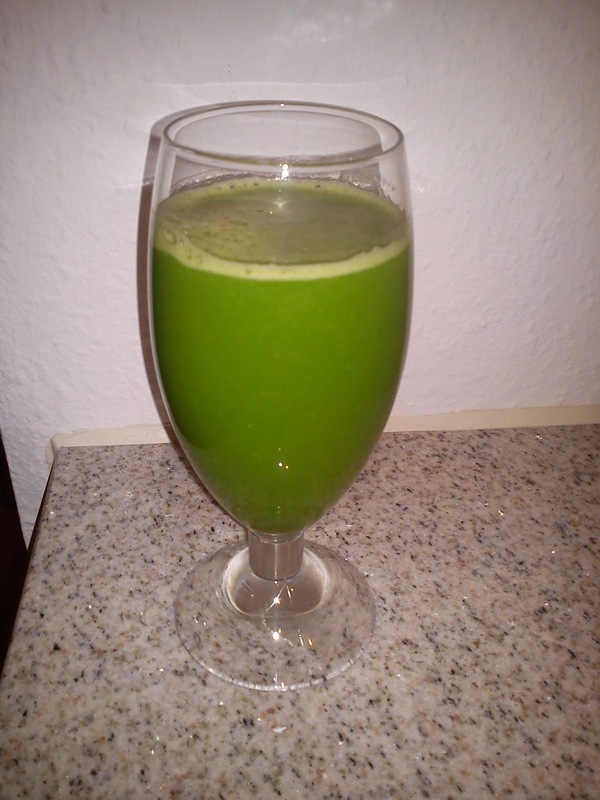 I can not taste the fennel at all in this juice. I have found this cake recipe in a weekly magazine "Livsstil" to my daily newspaper, which I decided to tear out of the newspaper for two reasons. The first reason being, that instead of the "normal" flour breadcrumbs was used !!! And the second reason being the high amount of fresh berries added into the cake mix. I find it very interesting, that breadcrumbs is used as flour in this cake. You can not taste or feel, that bread crumps is used instead of normal flour. The use of bread crumps is also an excellent way of using up bread crumps, which is not a much often used ingredients in my kitchen. I made two small modifications to the original recipe. First modification I replaced hazelnuts with almonds, as I had no hazelnuts in my kitchen cupboard. And second modification I added a total of 375 g fresh berries instead of the original 325 g fresh berries. Heat up the fan oven to 175'C. Rinse and clean the fresh fruit. Melt the butter in a cooking pot. Whip egg and sugar in a stand alone mixer into a foamy structure. Mix the rest of the dry ingredients together, stir into a homogeneous mass. Add milk into the melted butter. Mix the melted butter-milk into the egg-sugar mass, followed by addition of the dry ingredients mix. Stir into a homogeneous mass. Gentle stir the fresh berries into the cake dough. Fill the cake dough in round cake form with a diameter of 27 cm. Bake the cake in the middle of the fan oven at 175'C for 50 minutes. Check that the cake is baked, before removing it from the oven. Sprinkle the cake with icing sugar - optional. I recently noticed this recipe on raspberry jam with star anise by Dansukker, which I was attracted at once, so I decided to make my version of this jam. I really love the look and flavour of star anise :-) I like to keep the added ingredients inside, so in this case you can up with small pieces of star anise inside !!! Therefore I went shopping for some frozen raspberries, as I already had used up my home grown raspberries in this classic raspberry jam. Heat up the semi-frozen raspberries in a cooking pot together with the Muscovado sugar, star anise pieces and thyme string. . When the raspberries have reach a temperature of 80°C, add the gelling powder and agitate very well. It is important NOT to add the sugar at this stage, as the gelling powder need the water from the fruit to hydrate sufficiently. Add the sugar to the fruit. It is very important, that you add the sugar little by little, while you agitate, in order to pre-gelling/gel lumps in the jam. Bring the fruit the boiling point again and boil for another 2 minutes. Taste the jam, decide is you would like more sweetness or acidity in the final jam. At this stage I work with extra addition of sugar or vinegar. Specific for this jam I ended up with adding 4 tablespoon of dark Muscovado instead of the 2 tablespoons used in the Dansukker recipe. Prepare the jam glasses by filling them with boiling water. 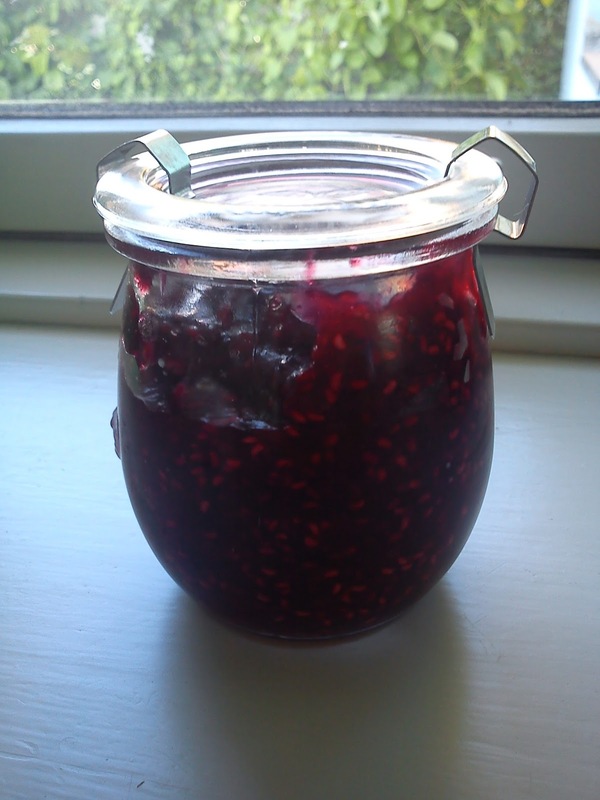 Another thing you can do is to store the jam cold afterwards to increase the shelf-life. As the jam is made from 2 parts of fruit and 1 part of sugar, the sugar content is not high enough to preserve the jam. Fill the glass with jam and close the glass. When I travelling either business or pleasure I like buy tea as "souvenir", as it brings back the memories of that travel, when ever I enjoy a cup of this tea. This Spring I spend some days doing Stockholm. 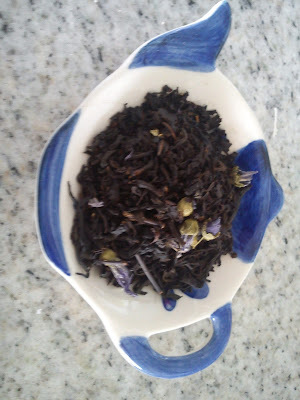 Here I brought NKs (Nordiska Kompaniet) blue Summer is a black tea with bergamot flavour, lemon, cooling flavour of vanilla. Decorated with three different sorts of blue flowers. 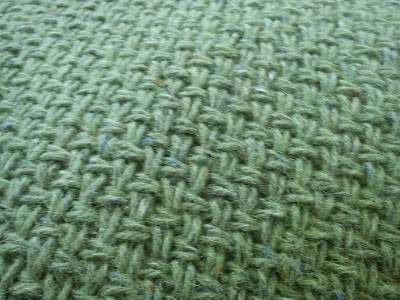 During the Summer time I have been knitting on this sofa cushion with a front pattern of wicker pattern and a back-side pattern of stockinette stitch. 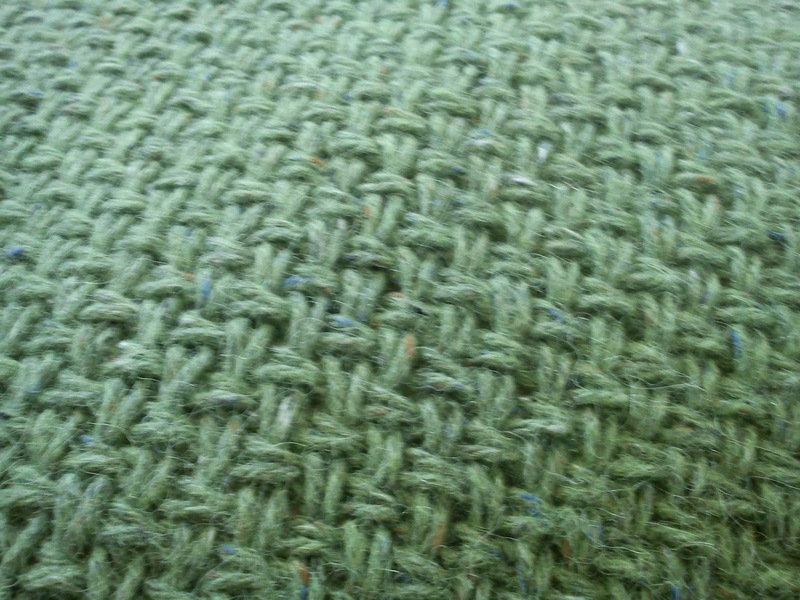 One evening with the knitting needles did therefore not produce a lot of knitted sofa cushion. 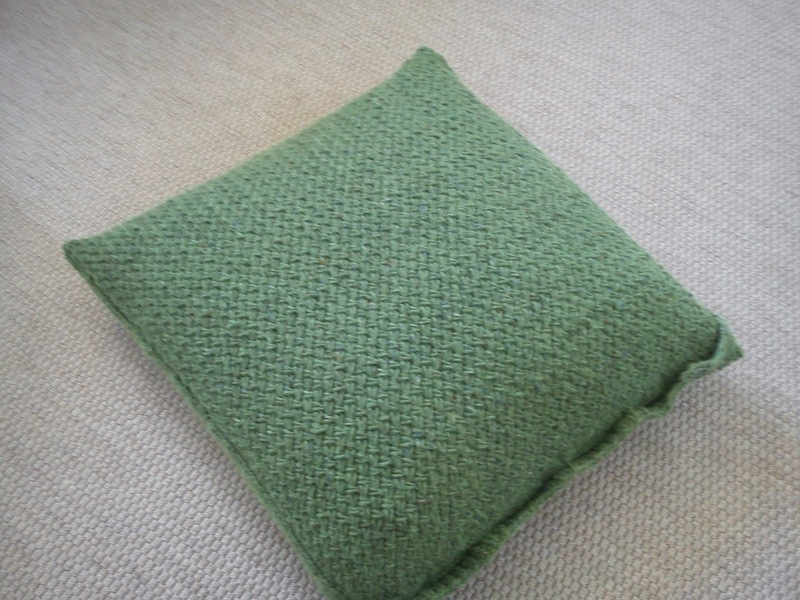 Afterwards a duvet with feathers has been used for filling of the cushion. 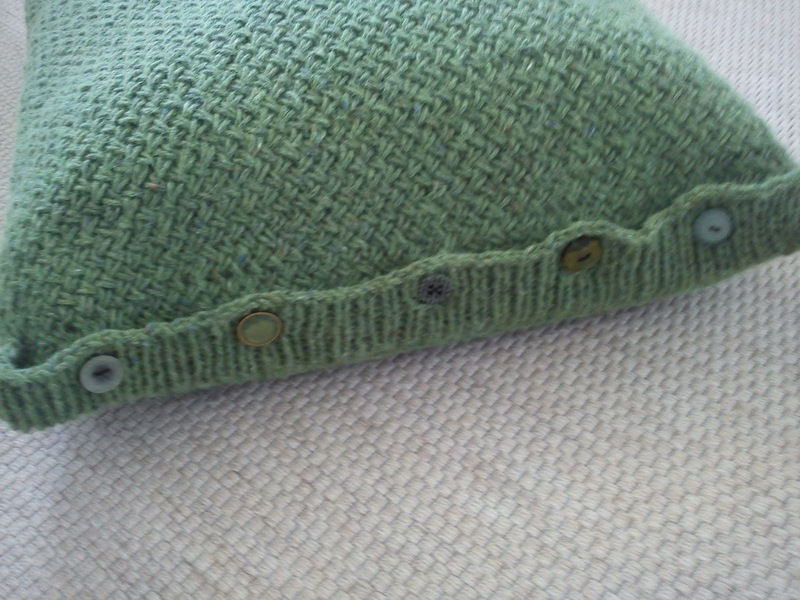 Finally the cushion was closed by 5 buttons. I have spend 560 DKK on yarn, button and duvet on this sofa cushion, which still is cheaper than buying a designer cushion.